I surveyed the market on what people expect to be trendy in 2017. Here are the results in order of voter percentage. Game Used (GU) & Autographs (AUs): 22.4% of responses. Coming in just above the Prospecting category. It's no surprise that this category continues to trend. 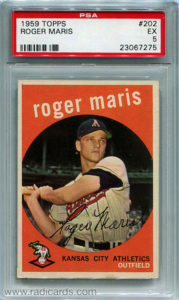 A large part of the market is driven by what are known as Hits and the term can be commonly associated with cards featuring relics and autographs. It's a trend that started in 1997 and has continued throughout the years. While collector exhaustion with this category may be a conversation meant for the results of another survey, the GU/AU design continues to be implemented from all of the major companies. Some collectors think that this category has contributed to the disinterest in and/or downfall of set building. Base cards have sort of taken a backseat as filler, and are often doled out to team collectors, local charities, or sent to players Through The Mail (TTM) to have signed and sent back (a great way to continue enjoying your base cards). Some collectors also think the GU and AU thing has been watered down over the years, which is why you can find cards in this category going unsold in $1 bins at shops and shows all over the country. 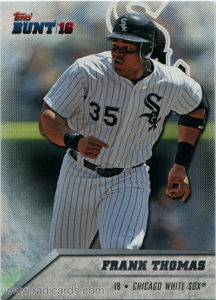 GU and AU cards of superstar and HOF players continue to attract collectors, however. Prospecting: 20.4% of responses. It's no surprise that this led a strong amount of votes for what's believed to be trendy in 2017. Prospecting has always been a hot category. The possibility of cashing in down the line can make collecting rookies really interesting for investment-style collectors. It's fun to see what's produced for new hopefuls. 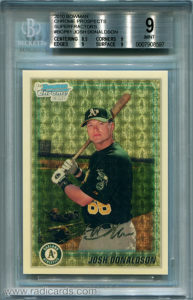 Bowman Chrome continues to drive a large part of this category with low-numbered autographed parallels carrying a lot of the weight in popularity. It's a given that some guys will pan out while others won't. While the risk can be high, the return can be equally if not higher. This is especially the case for the lucky collectors who had the foresight to collect Mike Trout in 2009, Bryce Harper in 2010, and Kris Bryant in 2013. With three guys, thousands are left in the dust to be either developed later, sent down, or otherwise forgotten. Collecting superstar hopefuls continues to be a gamble but it can be interesting to watch player careers as they develop regardless of the quality of the results. Vintage: 17.3% of responses. I would assume that with time, the notoriety of this category will continue to grow and reach new heights in popularity and prices. Vintage will always be collectible and its value will only appreciate with time. High grade copies of pretty much anything always seem to perform well in market. This end result happens not only for superstars but common players as well. This is especially important for set collectors and people who want a solid copy of their favorite player(s) from a certain set or run. I suspect that vintage will always be in high demand in the hobby. As time goes by and modern sets creep into this category, the junk wax era will take on a new surge of interest. Given production output, however, this will take some time. With regard to investment quality, this category continues to be a sure shot. If you can swing it financially and want a safe bet, this might be the category for you. Buy or sell, vintage cards continue to grow both in popularity and value. Ultra High-End Products: 10.2% of responses. I was surprised to see this category voted so frequently. Topps broke a new SRP record with the Transcendent line at $22k-27k/box depending on where it's sourced. The product is actually quite amazing and you get a ton of cards. It's certainly a unique concept and one that definitely draws a crowd. The set reminds me of how high-end sets were curated back in the 1990s in that it features the ultra-talented almost exclusively. For the price, this should be the rule not the exception. Something else I like about this product is the art on the sketch cards; it's beautiful. These are just a few iconic cards off the top of my head. So the question then becomes, which would be the better investment? A high grade Nolan Ryan rookie card, or a modern card with metal borders featuring Nolan Ryan's autograph and a print run of somewhere between 1 and 65? This isn't a tough question to answer accurately and I'd feel at least partially confident in assuming that most collectors can figure it out quickly. Whatever the case here, and as much as I love Topps and its highly versatile portfolio of annual releases, cost and accessibility continue to be issues for a large portion of collectors. I will say this, however, regardless of whether or not I'm a participant, watching box breaks of the ultra high-end is a lot of fun! 1980s & 1990s: 9.2% of responses. This is a favorite category of mine because these are the decades that kicked off my passion for sports card collecting. With more collectors reaching their 30's and now with more discretionary income than they had when they were kids during these two influential decades, they can now buy the cards they always wanted to own when they were young. While a category for Graded wasn't included in the survey, I'd assume that growth in interest in this category, especially with regard to 1980s and early 1990s rookie card examples, may be correlated with growth in a Graded category as well. For me specifically, I'm after high grade copies of cards I always loved but couldn't afford as a kid. For the 1990s, interest has increased considerably since 2010 alone and continues to strengthen with each passing year. A part of me feels like collectors are latching onto releases from the 1990s more because they're tired of seeing the same ol' same ol' from modern releases. Now, I understand that the data here represents what people think will be hot in 2017, not what people want to see in 2017. Whatever the case, the immense competitive atmosphere that existed in these two decades resulted in a vast range of interesting technologies, designs, release methods, and insertion ratios and all mostly without including relics and autos on every card. This is something a lot of collectors love about these two decades. Buybacks: 6.1% of responses. Buybacks have seen a massive surge in implementation over the past few years. It's the hope that manufacturers slow it down a bit to maintain at least some amount of product integrity. 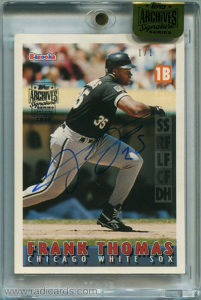 The Topps Signature Series release model is built entirely on the buyback concept. It's cherished by some but avoided by others. If you collect a player that's featured in the set, there may be some 30 cards available for your player, each signed and serial numbered to 1 copy. Expect to fork over the bucks for any of them. While I like the concept, I think it's been overdone and it's disappointing to see the same card two years in a row with the only change being a print run but sometimes not even that has changed. These are nice additions to any collection; I truly believe that but do I need to chase down 30 1/1s for my guy two years in a row? As much as I love seeing cards from my youth signed and stamped to 1 copy, sometimes too much of anything is overwhelming. Parallels, Kid-Friendly Options, Redemptions, and the Other category: While I'd like to see a lot less parallels and redemptions, I'm not convinced that these trends will settle in 2017. I believe collectors will still be pulling redemption cards only to be left waiting for months, sometimes years for their returns. The redemption program would be cool if the redemption cards themselves were actual cards featuring the players depicted on the card text, much like they were in the 1990s. As for Kid-Friendly Options, I think the physical release of Topps Bunt was a nice touch in 2016. While the data here indicates that collectors don't think this option will be popular in 2017, it would be nice to see a couple more affordable options thrown in the mix. Didn't get a chance to respond to the survey? Tell us what you think will be hot in 2017 in the comments section.